A gifted medicine woman friend of mine shared this on Facebook and I need to share it farther and wider. It concerns me that some people will read the title and discount this as some Native American ‘thing’. Our nation’s Constitution was based on this Great Law of Peace, yet our Founding Fathers did not include women as part of the decision-making process. Perhaps it is lore, or not, but I have been told that some of the Native elders who were counseling some of the Founding Fathers warned these writers of the US Constitution at that time that it was destined for failure if the women were not included in the US government decision-making process. It’s not that it needed to be all women. Just a balance of the women elders with the men elders. Here it is now 2015 and we are witnessing a nation sorely out of balance (an entire world out of balance) and the Sacred Feminine rising up powerfully to restore balance and harmony with the Divine Masculine. 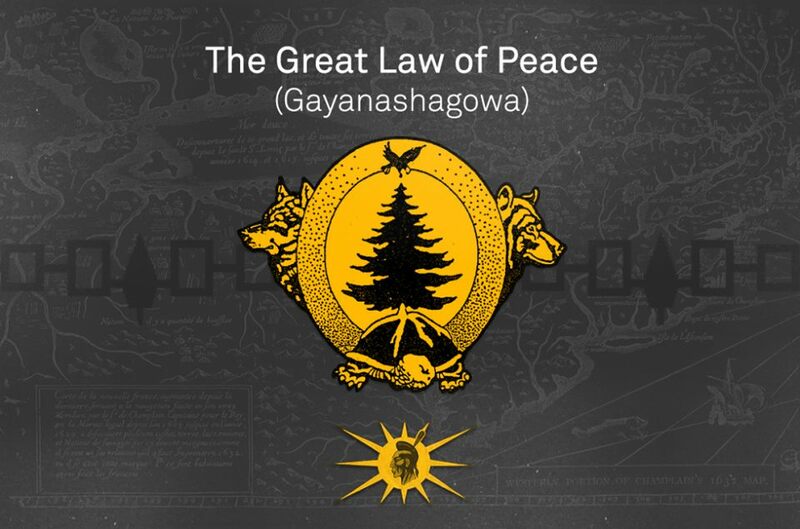 This is well worth a good long study — the “Great Law of Peace” and the Peacemaker’s teachings. The Peacemaker embodied the wisdom and spiritual gifts from the Christ Consciousness. Some of this wisdom is included in my book The Great Mother Bible, about to come off the presses in the next few weeks. Ebook is out already at your favorite ebook venues. First and foremost the Peacemaker said, “The Word that I bring is that we are to love one another and live together in Peace.” Same message many Messiahs have brought to the People. However he then gave us guidelines as how to achieve this between men and even between Nations, his work having created the first and only true Democracy and the first United Nations. His teachings are taught in the Oral Traditions of this epic journey he embarked upon to teach warring nations to live together in Peace. He begins his journey in a white stone canoe… when challenged that it will sink like a rock, he proclaims that it will show his words are true, a metaphor for standing in our truth to make impossible things happen. The first person he sought out was a woman, Jigohnsaseh meaning “New Face”. She was already a re-known Woman of Great Peace but even though her people had relative Peace and Prosperity, still all was not right. There is some thought that the Peacemaker studied the neutrals ways of diplomacy and the “work” of agriculture which provided the abundance of food the people enjoyed….. and he saw ways in which the Peace could be enhanced. Jikohnsaseh caught his vision, and became an ardent supporter of it. Her work was to teach the people to love…. when only hate, and anger existed. She organized her women to promote and teach the ways of Peace to the warriors and the young. By enlisting the clan women, the Peacemaker had half the battle won. Now he had only the men to convince. His next encounter was a Cannibal. Here we get the next steps in the teachings…. “The Good Mind” for the Cannibal did not have a good mind…. First the Peacemaker showed the man his true nature, that inside he was a beautiful creation of the Great Spirit.. and the man on his own reasoned that the way he was behaving was not suitable for such a noble person. But when the Cannibal repents, he is even more miserable for now he carries the full knowledge of the evil and harm he has brought to others. The Peacemaker now teaches us to forgive the past and let it go. What is important is what we do now that we have “The Good Mind”. We need to visibly change and go about doing good for those we have wronged, and work for our people to make changes that will make everyone happy. We need to give back to Society. This teaching has become known as “Restorative Justice.” Many tribes are now using this principle to keep their children out of the White Mans legal system. They keep offenders at home, and make them work in the community. The offenders begin to feel like contributors and that they are needed and it creates a change in their behavior. But the concept of the “Good Mind” is a loving behavior and Peaceful heart. It requires a good mind but also a healthy body. They go together. If one is sick in the body or in the spirit then the mind is affected and it is hard if not impossible to have a “Good Mind”, to be able to think clearly and in a good way. So now it comes to understanding food, environment, thoughts, and how these things affect our mental, emotional, and physical health so that we can become strong, healthy and see clearly to make good choices. Next, the Peacemaker teaches the Cannibal “to never go against Nature.” Volumes are spoken in this one sentence as the children of the Earth reconnect to the Mother and all forms of life that are on her….. To respect life all forms of life, recognize that life is sacred and all things live and have a spirit… even a rock. With compassion the Peacemaker listens to the Cannibal’s sorrows and lamentations. Then he asks for the Cannibal’s suggestions as to what would have helped him take a different path. And the Peacemaker now condoles, (like a prayer) with the Cannibal until his spirit, soul and mind are completely restored. In this story we come to understand that all illness begins with the spirit. Once the spirit of the Cannibal was healed his health and mind was also. It is thought this cannibal, perhaps a man named Hiawatha (Hayenwatha), became the gifted spokes person for the Peacemaker. This act of compassion and love becomes the basis for our condolence ceremonies. Later in the story another individual is so spiritually ill that even his body reflects this with snakes writhing in his hair and the crookedness of his body but when the people heal him with an outpouring of forgiveness and love, his body and his mind is made straight and restored to look like other men. Frustrated with the Mohawks taste for war, the Peacemaker speaks and acts with fervor gaining the respect of these warriors. He tells the Mohawks, “There is no place for violence in the heart that honors the teachings of the Great Spirit. Only a supernatural event moves the warriors to join with him in his quest for Peace, but once convinced by “the Master of All Things”, the Mohawks become stalwart emissaries themselves, becoming the Peace Council. The Peacemaker sees the hearts of the people and he raised up great leaders that would preserve the Confederacy once he had left. This is shown when he takes counsel with others to find solutions when he could have handled things all on his own. He gives the fledgling confederacy many opportunities to use “the Power of the Good Mind” to do “Conflict Resolution”. To be proof against anger, offensive actions and criticism. Your heart shall be filled with peace and goodwill. Your mind filled with a yearning for the welfare of the people. You shall have endless patience and firmness tempered with tenderness. Neither anger nor fury shall find lodgment in your mind. Your words and actions shall be marked with calm deliberation. View not only the present but also the coming seven generations. In the end, He established the Four White Roots of Peace of the Great White Pine, the symbol of the Confederacy as the boughs reached out to protect all who seek Freedom and Peace under its boughs. Love so that people would care about each other and have compassion and empathy for others. Peace so that people would not live in fear. Power of the Good Mind to Reason and not throw ashes on one another. Righteousness is Justice between men and Nations. Then he established the women as the proprietors of this Peace. In their hands were the sacred obligations of caring for the gifts of the Mother Earth, the raising up of the leaders and the decision-making concerning all issues of great concern to the people. Men were chosen to speak the minds of the women in council so that it was known what the women wanted and the women decided the question of Peace or War. This platform goes back to the Creation Story and Sky Woman, when it is established that none are greater than another. All are equally important. That all are part of a whole and if any part is left out then the sacred hoop is incomplete. Among the Haudenosaunee (Iroquois) this belief is called the “Twinship Principle” in honor of the Twin Creators. In our present dominant society everything is a competition…. Men against women, parents against children, night against day, good against evil, right against left, blue against red, black against white….. mankind against Nature. But in the Old Way it is my understanding this was not so. Both are halves of the whole, working together to create harmony, and balance. He showed us how to pray. He gave to us our Thanksgiving Address, again one of our ceremonies, which gives thanks to the Mother Earth, for her water, her breathe, her soil, her tree people, her plant people, her medicine plant people, her fish people, her bird people, her animal people, her mountains, rain, winds, the Thunderers, Enlightened Teachers, the Protectors, the Sun the Moon the Star Nations, and the Creator and give thanksgiving to any that we may have been forgetful of so that we may not slight any. One other important teaching that comes down. If mankind would become the spiritual human being that he was created to be, full of love for all life, with no anger, no hate, no deceit, no judgment, that our Mother the Earth would heal instantly. We could restore her completely for the Seventh Generation. Yes, the Peacemaker taught that also. And he taught that the White Roots of Peace should go to the Four Corners of the Earth, that all who sought Peace, Reason, Justice, and unconditional Love, would find shelter under the boughs of the Great Tree of Peace. This entry was posted in Divine Feminine, Divine Masculine, Divine Mother, Earth Mother, Earth Mother Message, earth spirituality, Pachamama, quote, Society Ills, The Great Mother Bible and tagged Christ Consciousness, Haudenosaunee, Iroquios, Mohawk, Peacemaker, The Great Law of Peace. Bookmark the permalink.